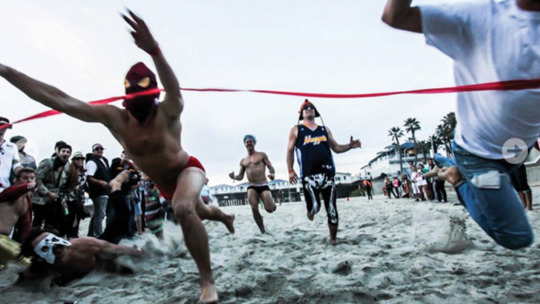 This annual celebration is the mother of all Super Bowl Parties. 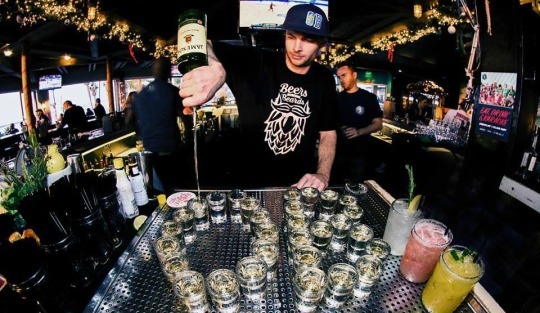 Firehouse, a Pacific Beach staple for their spacious, roof-top patio and fun vibe, creates their very own “back yard” by fencing off their huge parking lot. This BBQ wonderland features food from different vendors, all sorts of drinks, live DJs, couches, bleachers, a 20 foot teepee and a 20 foot LED Jumbotron. Tickets are $20 and it sells out every year, so if you want your Super Bowl to be super-sized, look no further than the Firehouse. If you are a betting person then The Rabbit Hole is the spot for you this Super Bowl Sunday. Not only can you enjoy food and drink specials all day, but there will be side games, giveaways and a square bet pool, so get your square picks in today! 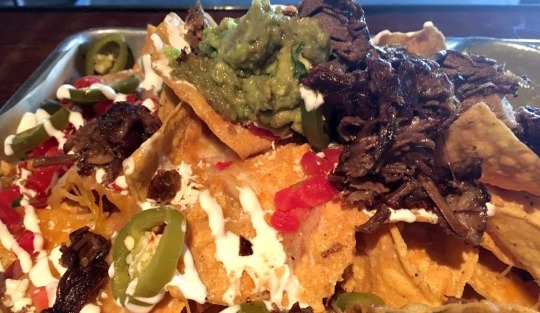 Must-try football grub includes their (anything but) Normal Nachos and Fire-In-The-Hole spicy wings. Home & Away is the spot for you if you want to watch the football game but don’t want the extra hubbub of a big Super Bowl event. This is because H&A has 12 TVs around the bar along with two outdoor TVs over an expansive patio. This is a great place to take your non-football loving friends too because there are tons of games like darts, beer pong, ping pong, corn hole, giant Jenga, foosball, board games, cards and more to keep them entertained while you watch the game. They truly have something for everyone and will be serving up their amazing, house-smoked BBQ they are known for all weekend. This beach hotspot has one of the best views in San Diego, looking out over the Ocean Beach pier as waves crash around the plethora of surfers. On Super Bowl Sunday, however, this will be the go-to bar for beach goers and OB-tians. With a full array of Super Bowl beer and drink specials and tons of huge TVs, this is a great spot for game-watching, drinking and just hanging with friends. They have a full list of craft beers on tap and one hell-of-a Salty Dog that shouldn’t be missed. BBQ and beer are on the menu for our Super Bowl Sunday here at Thorn Street Brewery. We are the ultimate, laid-back, game-day location, so if none of these other spots are of interest because of the likely hubbub, TSB is for you. The game will be on multiple TVs, we will be pulling down our big screen for the game and as usual, 15 different craft beers will be available. Also, our good friends over at Grand Ole BBQ Y Asado will be providing the grub for the game with their amazing smoked brisket, pork and more. There you have it, Super Bowl plans for every type of game-day viewer. So get your bets placed, your friend invited and have a fabulous day of football, food and fun! 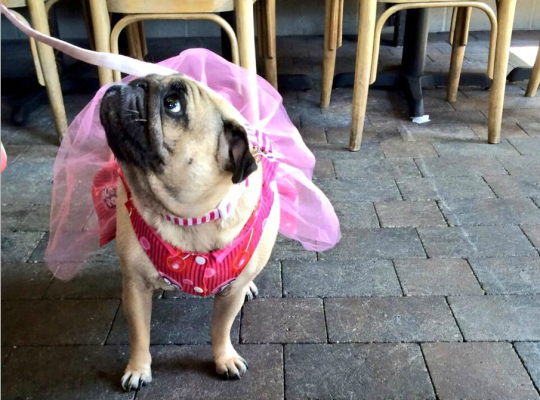 Pic by Yelper Tony D.
Not only is Carnitas’ Snack Shack pork-heaven for people, but it’s a swell place for dogs too. Named after their beloved pot-bellied pig, Carnitas, owners, Hanis Cavin and Sarah Stroud have been serving up the best pork-centric food in San Diego since 2011. Must-try dishes include their famous Pork Belly appetizer and the Triple Threat, a delectable sandwich filled with pork loin schnitzel, pulled pork and their house smoked bacon. 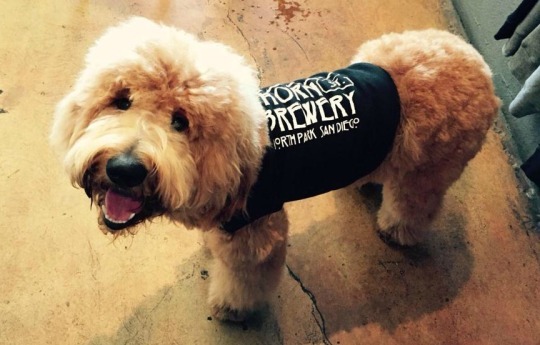 They also have a solid line-up of rotating craft beers and wines on tap and with a recently upgraded patio allowing plenty of room for you and your pooch (or pig), this spot is a guaranteed good time. If you are looking for somewhere a little more upscale to take your four-legged friend, look no further than the Patio restaurants. The Patio on Goldfinch and The Patio on Lamont are well known for their welcoming nature to dogs of all shapes and sizes. When you walk in, the staff will immediately offer your dog a fresh bowl of water and a house-baked dog treat. Both locations have stellar craft beer programs and often hold special beer events like their Torrey Pints series, which focuses on craft beer education and local breweries. 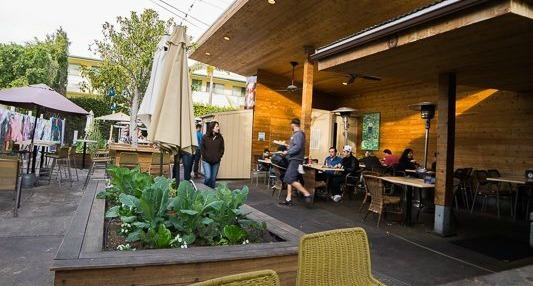 There is plenty of space on their gorgeous patios, lined with living walls and plant installations, and if you go to the Patio on Lamont, you can get ½ off drinks on their Dog-Tails drink menu when you bring in your pup! Keep an eye out for the opening of their new restaurant concept, Fireside at the Patio, which will offer even more outdoor seating than they have done before, adding to their growing list of dog-friendly spots. Not just-another-patio in San Diego, Home & Away is all about the fun of hanging with your friends, watching the game and enjoying great food and craft beer. 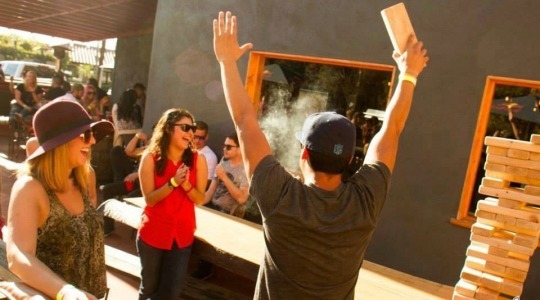 Their spacious, stained-wood patio boasts a ping pong table, corn hole, giant Jenga, beer pong and more. 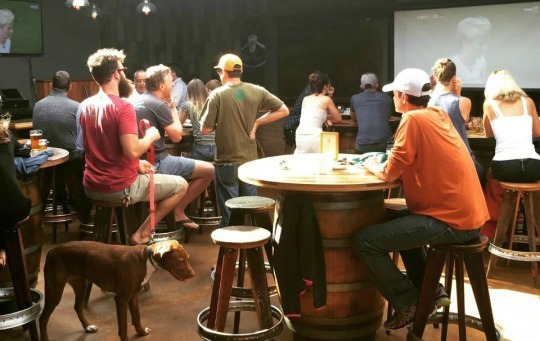 This also happens to be the best place to watch the game with your pup because they have two giant TVs out on their patio along with a full NFL ticket and pretty much every sports channel you could think of. They offer 22 rotating beers on tap and are famous for their decadent 22 Burger with three artisan cheeses, their sweet and spicy wings (recently named top 5 in San Diego) and house-smoked BBQ which is available every weekend. Pic by Yelper Amy Y. 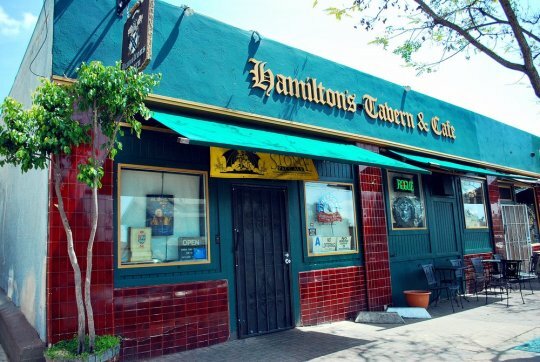 Most dog-friendly restaurants can only allow dogs on their patios, but these last two spots have a little something extra…like here at Hamilton’s Tavern, where you can bring your dog inside while enjoying food and drink. How is that allowed? Well, the delicious hand crafted sausages, crispy wings and insane grilled sandwiches that they serve actually come from Hamilton’s Café right next door to the bar. Therefore, it’s perfectly legal and acceptable to eat your food alongside your pooch while enjoying a craft beer, making this a great spot for rainy days or colder nights out and about with your dog. Insider’s tip: This is the best spot in San Diego to get a pint of Pliny the Younger, so keep a look out for when they are tapping this Russian River, highly-limited release (ok, it’s Feb 17th at 3 pm, but you have to get there on time because the kegs go fast!). Last but certainly not least is Thorn Street Brewery. Sure, we might be biased, but TSB has been the go-to place for locals to enjoy a beer with their dogs since opening in 2012. This is another spot where you can bring your dog inside while also enjoying a bite to eat because while Thorn doesn’t serve its own food, it does have nightly rotating food trucks out front. You can also grab take-out T-32 neighbors, Grand Ole BBQ Y Asado or De Luca’s Pizza. Dogs are not only allowed, but celebrated at TSB with Cutest Dog contests and fundraisers like Pints for Pups which raises money and dog supplies for local shelter, Baja Dog Rescue. Fun fact, while family friendly, kids are only allowed in the brewery until 8 pm while your dog-baby is allowed to party at TSB all night long. 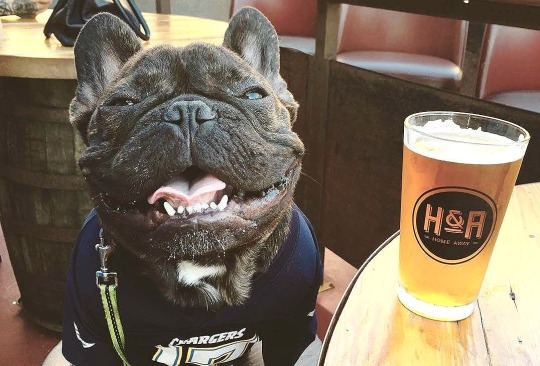 There you have our picks for the best spots for a date night with your dog or if you just don’t want to leave your mutt home when meeting friends out for beers. What dog-friendly spots do you think should be on this list? This American Pale Ale is considered a traditional, California style pale ale brewed with American 2-row barley and lightly toasted caramel malt. It’s known for being an extremely well balanced beer while also producing a pine and citrus hop flavor and aroma. This hoppy boost is courtesy of a generous late-kettle addition of dry hopped Centennial, Chinook and Cascade hops. American pale ales differ from English pale ales because of the type and amount of malts used. American ales use less sugar with the malts in the process while upping the bitterness a bit from the late addition of the hops. This amber ale uses a variety of crystal, amber and dark malts, blended together to create a rich, malty backbone of this easy to drink beer. To produce a taste of toasted caramel and biscuits, dark agave syrup is added to the boil. This addition gives the beer a distinct body without bringing any real sweetness. Finally, American style finishing hoops are added to created this “West Coast” style of amber ale. Perhaps one of the best-named beers in TSB’s portfolio, Foreplay Belgian Blonde is also one of the most popular. This is a traditional, Belgian-style countryside ale using Belgian Pilsner malt and spicy Czech Saaz hops. Belgian beers have a distinct taste from many other beer styles due to the specific yeasts that are used. 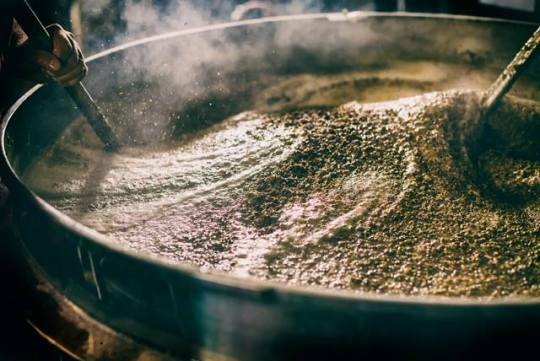 Belgian yeasts tend to produce spicy, fruity flavors while most American yeasts are designed to be relatively neutral to show off the malt and hop flavors of more American style beers. The yeasts used in Foreplay derive flavors of pear and apricot, which add a good amount of floral and spice notes. Belgian beers can be divisive because of this yeasty flavor, but are a wonderful choice for people not into the hop-craze that is happening in the beer world presently. This beer is a West Coast IPA powerhouse and possibly the most well known TSB beer. Relay focuses on a bright hop flavor and aroma rather than bitterness. The reason for the name is that hops are used in a relay race sequence with Simcoe, Centennial, Amarillo and Citra hops as the runners. This hop quartet produces flavors of mango, citrus, grapefruit and a bit of pine. While hoppy, this beer is not overwhelmingly strong in that department. In fact, people often remark at how easy this IPA is to drink, with no lingering after taste. No extracts here…this robust American Style porter is infused with hand-roasted organic coconut flakes to produce a taste of toasted macaroons, dipped in chocolate, which are then dipped in a fantastic, malty beer. Rich, dark caramel, chocolate and coffee help to harmonize with the coconut to create a beer that is just as easily enjoyed first thing in the morning as it is in the evening. At 8.3% ABV this porter packs a punch, though you would never know from the smooth, delicious taste. Now you are ready to stop by the tasting room for a flight of these beers (and more). Using this list to start at mild and move to wild, you will be able to experience all the flavors outlined here while discussing their merits with one of our outstanding beer-tenders. Then pick up a growler of your favorite one and let us know which core you got to know!